My girls get up WAY too early. Usually I am lucky enough to get a few minutes of extra sleep while Mike gets them settled on the couch, watching cartoons and drinking sippy cups. When he's off to walk the dog and get ready for work I find myself fumbling around in the kitchen trying to come up with a hearty breakfast that will hold little bellies over through kindergarten and other morning activities. 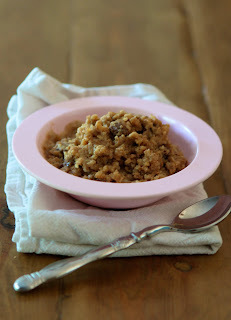 I was very excited to come across this overnight slow cooker porridge! 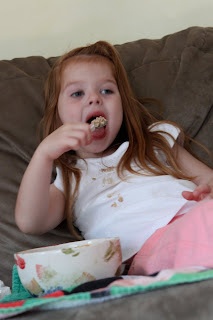 My kids love oatmeal. This porridge is a great alternative to those sugary instant packages. You can really add whatever you want to it; sliced fruit, nuts, more spices, etc. It is unsweetened so my kids like to add either honey or unsweetened applesauce to their bowls. If you find it is a little dry in the morning, just add some liquid and serve at the desired consistency. I keep it in the fridge for about 4 days. Reheat leftovers in the microwave, in individual bowls, with a little liquid. Place all ingredients in a 3-quart-or-greater crock-pot. Stir well to combine all ingredients. Cover. Set on lowest cooking temperature and cook overnight. If your crock-pot cooking time is set by length of cooking time, set for the longest cooking time and lowest heat. Spoon into cereal bowls in the morning. If it seems to dry, add some liquid. Not sure why I thought it was a good idea to allow porridge on the couch. That's a big bite for a little mouth. Yes. A serious lapse in judgement. Copyright © PrepAhead and Dine In: overnight slow cooker super healthy porridge. All Rights Reserved.